Before Ken Burns debuted his epic PBS documentary smash Jazz in 2001, the award-winning multiple volume installments of the genre had struck a chord with audiences in the Masters of American Music series in the '80s and '90s, filtering into living rooms via VHS or televised broadcast. For the first time since their debut more than a decade ago, this award-winning and highly acclaimed series has been released to jazz aficionados the world over, as Masters of American Music's first four volumes premiere on Limited Edition, slim-packaged all-region (aka Region 0 or Region free) DVDs ensuring that they'll play in all parts of the world. While 2010 will bring more volumes to fans with the second installment's release of titles that focus on John Coltrane, Sarah Vaughan, Count Basie, and a special history of the blues dubbed Bluesland, the initial quartet of digitally remastered discs are dazzling. Assuming that it would be the first volume in the collection, I opted to play The Story of Jazz first before I discovered that it was actually the fourth installment. As I soon learned, Masters of American Music originally kicks off with exclusive specials focused solely on three of the most influential Masters themselves including the impressive "first and only authorized documentary" of Charlie Parker entitled Celebrating Bird which earned recognition and accolades from organizations including the American Film Institute in 1987. Following up this portrait of Bird in an era that also found popular culture embracing Parker in Clint Eastwood's biopic of the same name, were the two other Masters selections, namely the Cable ACE award-winning documentary Lady Day: The Many Faces of Billie Holiday (Volume 2) and Volume 3's more intimate study of Thelonious Monk: American Composer. The latter title sought out to present "the first fully rounded portrait of Monk" as opposed to the traditional way he was "often portrayed as not simply eccentric but crazy" by focusing on the bebop pianist's strength as a "witty satirist" who became "jazz's first major composer after Duke Ellington." Yet, since I've dissected documentaries on the other figures before and wanted to focus on the heart of the series, I went right to The Story of Jazz first, which-- just like the others-- is fascinating not only for its historic footage of rare performances and inclusion of figures usually overlooked but also due to the straightforward and approachable narrative. Since jazz can be such a daunting genre, as noticed in Burns' exhaustive but incredibly well-researched presentation, I appreciated the choice not to dwell on every single facet of each movement from its roots in West Africa to its official New Orleans birthplace and various incarnations including big band, swing, bebop, bop, free, and fusion. No, the documentarians instead avoided minutia by opting to engage us by simultaneously inspiring our own interaction to look up more figures they discuss briefly and/or to look forward to the future in-depth releases on those we're particularly fascinated by including singer Sarah Vaughan who will receive her own volume in 2010. 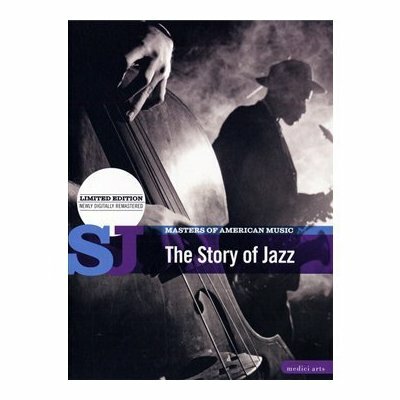 Recipient of the 1995 Swing Journal award for the Best Music Program of the Year, The Story of Jazz-- similar to the rest-- was derived from a wide array of in-depth footage including more than 80 interviews with insiders and experts who understand the music, the players, and its impact on our history very well. Additionally, correcting the main belief that it's simply an American art form and overall as purely American as "baseball," "national parks," or "apple pie" (two of which have also been the subject of Burns documentaries), the fact that the Masters of American Music series can be played on DVD in all regional country coded players is extremely fitting as the thesis of this set takes the "American Music" to an international level. To this end, jazz is evaluated-- especially in The Story of Jazz, perhaps more than some of the biographical portrait discs-- as one of the globe's "greatest art form[s] of the twentieth century." With its West African roots and the acknowledgment that Latin rhythms found their way into the music along with more international flavors as it gained in popularity in Europe and abroad, the all-encompassing genre of "jazz" eventually morphed into the epitome of one of its signature improvisational jams that can go on endlessly. Still, the title impressed me even more for ensuring that figures like Bix Beiderbecke, James P. Johnson, Scott Joplin, and Buddy Bolden all received their due alongside the more popular and familiar names of Duke Ellington, Fletcher Henderson and others. Similarly, I couldn't help realizing that even those who may argue that they're averse to jazz and find their appreciation for the arts is firmly planted in other genres or realms like film, painting, or comedy, will definitely want to explore this work regardless. For, although it's definitely suited and designed specifically for jazz fiends, the one underlying theme that pervades is that before someone like Thelonious Monk, Louis Armstrong or Duke Ellington can become a legend, they must have a strong foundation of knowledge in their subject. In other words, if you don't understand chord progression, you certainly can't bebop or bop and swing definitely won't mean a thing if you don't know your scales and it's the reminder of just how much knowledge and dedication to their craft (whether formally or self-taught) was required in the development of the art form. This is especially evident when musicians ventured from standard technical requirements to free or fusion jazz that again makes it seem perfectly natural that many actors and comedians liken clicking in a scene or working together to playing music or creating "great jazz." Whether you use the word "flow" as a writer when discussing the way that words will pour out of you or remain stranded when you're blocked or acknowledging that you can't attempt impressionistic or expressionistic painting without mastering still-life beforehand, the end result is always "jazz." Thus, the music is the very essence of joyous, unrestrained, creative expression that's necessary to challenge yourself to study. While I recommend listening to more varieties to find what you like, I feel strongly that a basic documentary will do the trick. And sure enough-- and possibly without even realizing it the first time around-- The Story of Jazz will hip you to the fact that what you assumed was "just noise," has suddenly echoed off the screen and as Charles Mingus phrased it, get you "Hit in Your Soul" by the sound of creativity. FTC Disclosure: Per standard critical practice, I received review copies of Masters of American Music in order to evaluate what it was I was writing about truthfully and as a professional journalist, the receipt of titles had no bearing on whether or not they received a favorable review as jazz fans are much more prepared to label something "bad jazz" if the flow is way off.